This Closed-End Fund is attractive after the recent sell-off, not only because it yields 8.7%, but also because overblown fear has caused it to trade at an unusually large discount to its net asset value. Strong management, very reasonable management fees, a prudent and conservative use of leverage, and a powerful market style allocation, all make this CEF attractive and worth considering. The Royce Value Trust is a small cap value fund. It generally holds US securities with market caps under $3 billion. The fund pursues opportunities when expectations are low and focuses on industries where the management team sees the greatest number of compelling bargains. One of the first thing that stands our about this fund is its attractive high yield. The individual holdings in the fund don’t yield 8.7% (they yield much lower), however the fund is able to pay the high yield (it’s paid quarterly) by prudently taking mainly long-term capital gains, as well as some short-term gains and sometimes a small return of capital. All in, the fund is paying investors 8.7% on a quarterly basis, and that is a little higher than usual because the shares have sold-off during October’s big market wide sell-off. The next this we like about this fund is that it currently trades at an attractive discount to its net asset value, or NAV. Not only has the fund sold-off hard in October because small cap stocks sold-off hard (a trend we expect to reverse in the months and years ahead), but also because fear stricken investors have inappropriately put such selling pressure on this fund that it now trades at an unusually large discount to its NAV. This basically means, as an investor in the fund, you get to basically buy all of the fund’s underlying holdings at a discounted price. There’s no guarantee that the discount ever disappears completely, but we expect the discount to narrow (which means more profits for you), plus you’re getting to buy the holdings (and the dividends) at a discounted price. Very attractive. The discount to NAV is currently 11.59%, which is large compared to recent history, and its largest this year, as shown in the following chart. Royce has a long reputation as a highly regarded small cap manager. The strong reputation and strong long-term performance record, has allowed founder Chuck Royce to attract and retain a very high quality active management team. The current portfolio manager, Jay Kaplan, CFA, has been with the fund for over 15 years. And according to him: "My goal is to find companies where expectations built into the current valuation are too low relative to what I believe is far more likely to happen." Jay is supported by a world class organization and investment team that help him manage this fund to meet and exceed investor expectations. This fund also offers relatively low and attractive fees for a closed-end fund. Currently only 0.54% (0.65% if you count the cost of leverage—more on this in a moment), the fee is extremely reasonable, and actual quite low for this attractive actively managed fund. The fund currently has a leverage ratio of 4.91%. Equity CEFs are generally allowed to use up to 30% leverage, and 4.91% is very low conservative, yet still attractive. 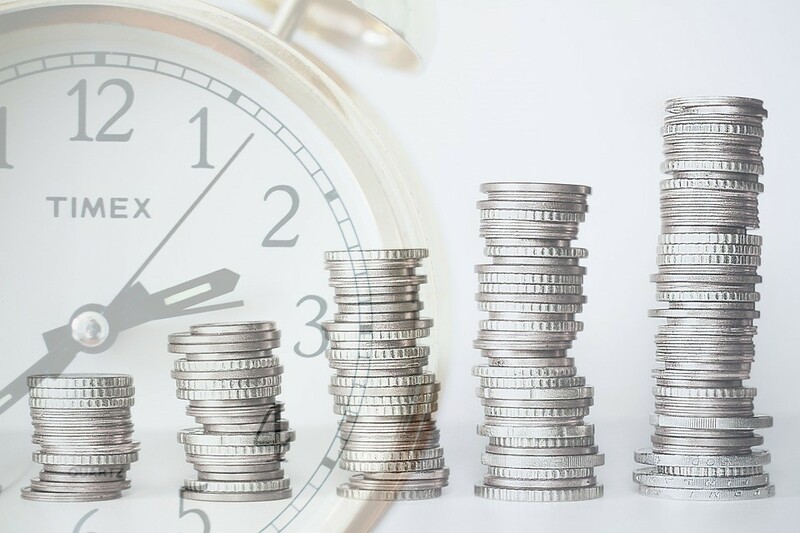 This ratio fluctuates overtime, but it basically helps the fund stay fully invested, and it helps offset some of the administrative and management fee costs described above. We’re comfortable with this low leverage rate. As mentioned previously, the fund invests in attractive, actively-selected, small cap stocks. As a group, we believe small cap stocks are attractive for several reasons. First, the space has underperformed large cap stocks recently, and this has made for a more attractive buying opportunity, in our view, as the style is due for some mean reversion. In fact, from a historical standpoint, small caps have generally provided higher returns than large caps, a trend that has been so pronounced recently—and something we view positively, as contrarians. Further still, because small cap stocks are less followed by Wall Street (compared to popular large caps) there are more opportunities for the Royce management team to identify attractive investment opportunities. 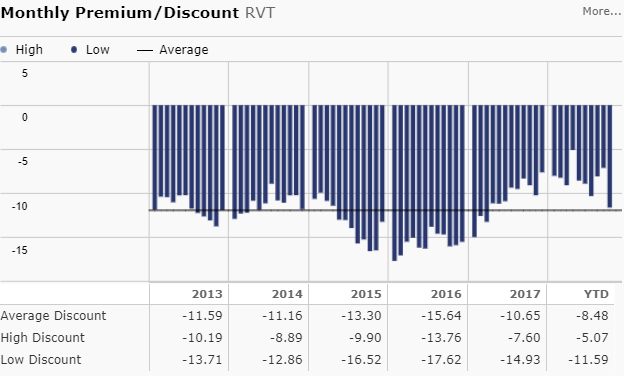 Overall, we consider the Royce Value Trust (RVT) to be an attractive investment opportunity, right now in particular presents an attractive buying opportunity. We currently own shares, and we have no intention to sell anytime soon. We appreciate the active management team’s efforts to create the high quarterly income payments for those who need it. And for those of you who do not need the income, be sure to reinvest those dividends, because if you don’t, you’ll have the extra spending cash in your pocket, but you’ll miss out on the long-term growth. For perspective, here is a look at the long-term performance of the fund with and without the quarterly distributions reinvested.